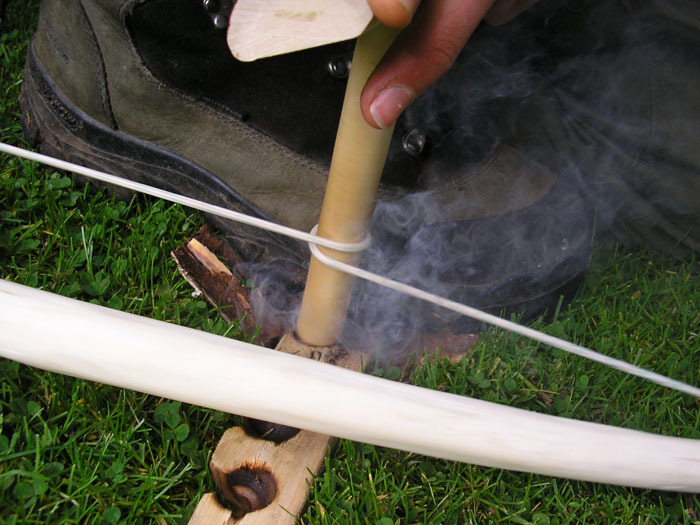 For me, learning to make fire by friction with the bow drill was the skill that first grabbed my interest all those years ago. 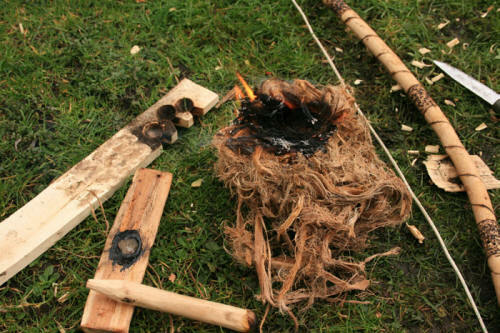 I was fascinated by the idea of making fire by 'rubbing sticks'. After seeing Ray Mears demonstrate this on TV, I had to achieve it for myself. 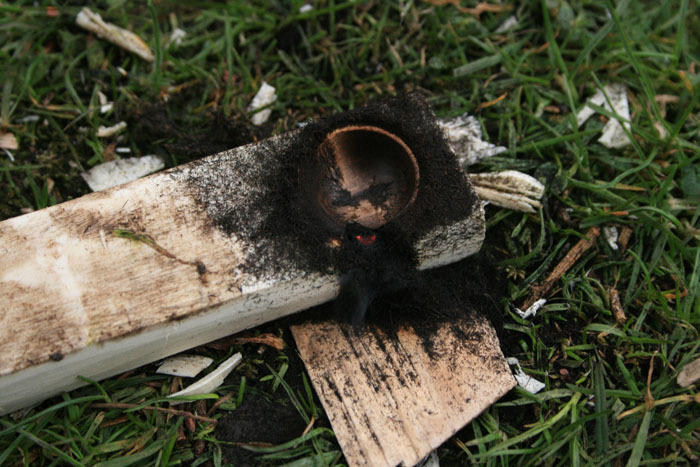 After a lot of hard work I made my first ember and blew it into flames. 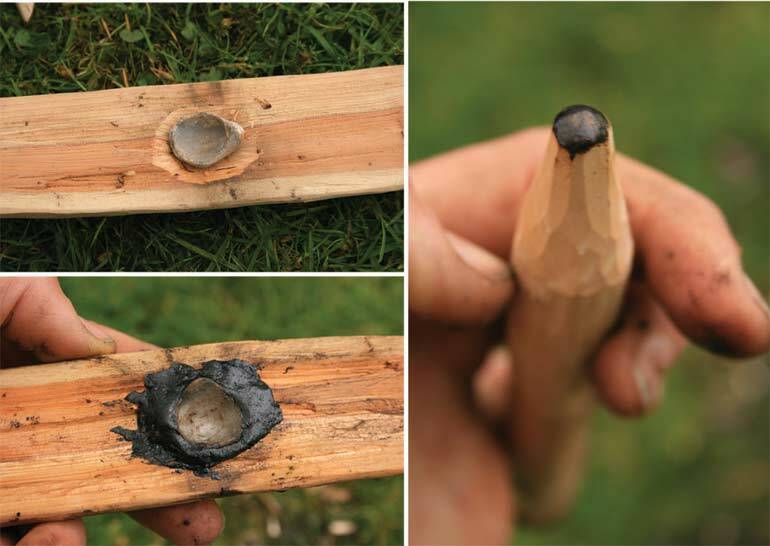 This literally ignited my interest in Bushcraft! Also, Take your time when making the set. Make it as well as you can the first time, if you take a slap-dash approach you'll just have to do it all again; which takes more effort and time in the long-run. 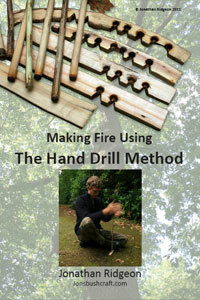 The drill is twisted into the bow and is held between the hearth board and bearing block. The assembly is kept secure and sturdy by securing the hearth board to the ground with your foot and by holding the bearing block tightly against your shin as shown. The bow is then moved backwards and forwards quickly, making the drill rotate and rub against the hearth board causing tremendous friction. A notch is cut out in the hearth board where a small pile of black charred dust collects underneath the drill. This dust becomes so hot that it eventually ignites and begins to smoulder, this smoking ember is then added to the tinder and blown until it bursts into flames. Experiment with your own combinations too! Wood that is dead and dry when found will act differently to wood which is cut fresh and then seasoned. NOTE: just listing that lime wood is 'suitable' does not necessarily mean that all lime wood will be brilliant. It depends on the conditions it has grown in, for example it may have grown very slowly, resulting in wood which is too dense; conversely it could have grown very fast, meaning it will be too soft. This goes for all types of wood. Usually it's best to get something in-between. 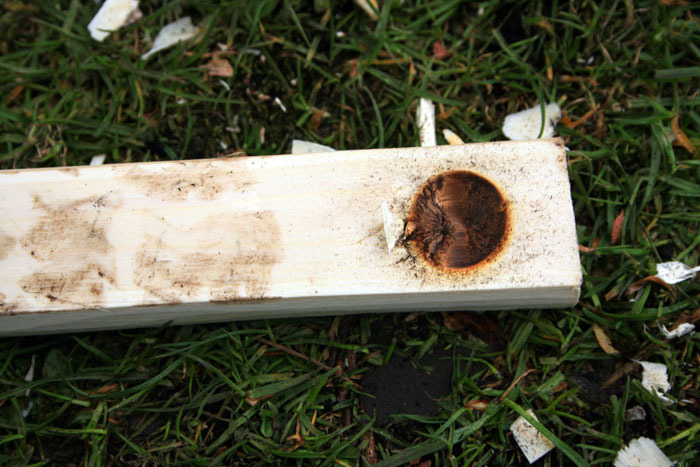 You can test the density of wood using your thumb nail. 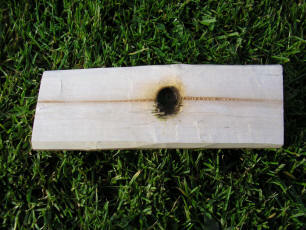 First of all you will need to select a suitable wood to carve your hearth board from. 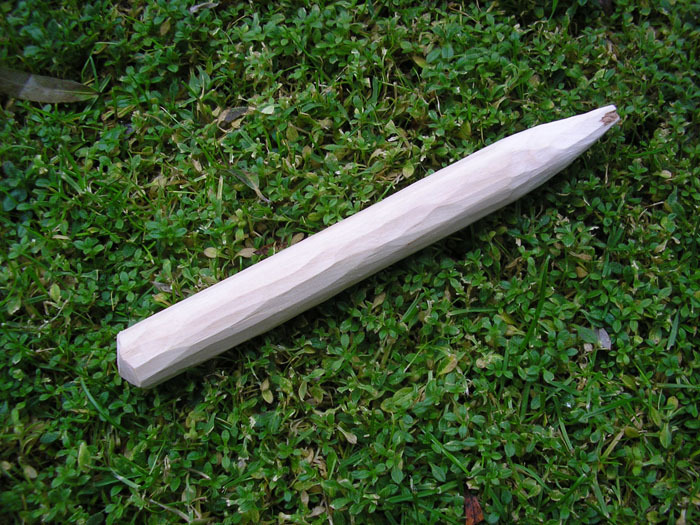 Experience has lead me to believe that Lime (Basswood), Willow & sycamore are some of the best woods to use. However many more can be used, and part of the fun is choosing and experimenting with your own choice of wood and getting familiar with the properties of each kind. 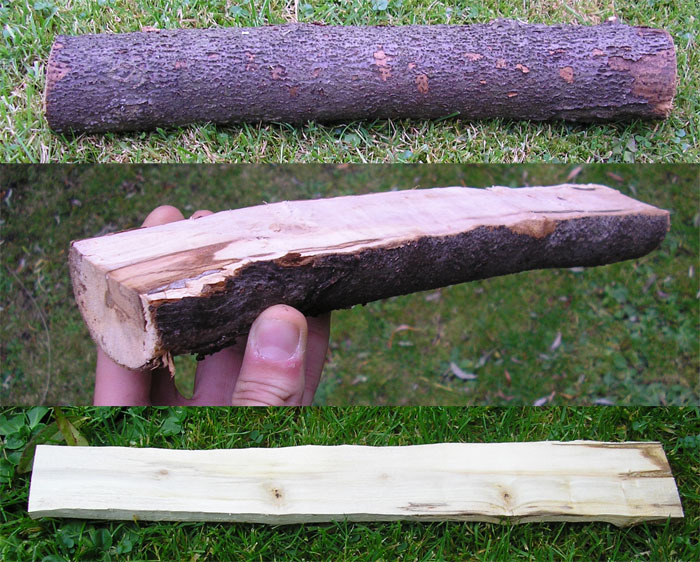 Dry dead wood is obviously more suitable than fresh wood. Either cut wood and leave it to season, or select already dead pieces. Dead wood found on the forest floor will be damp unless the climate is very dry. 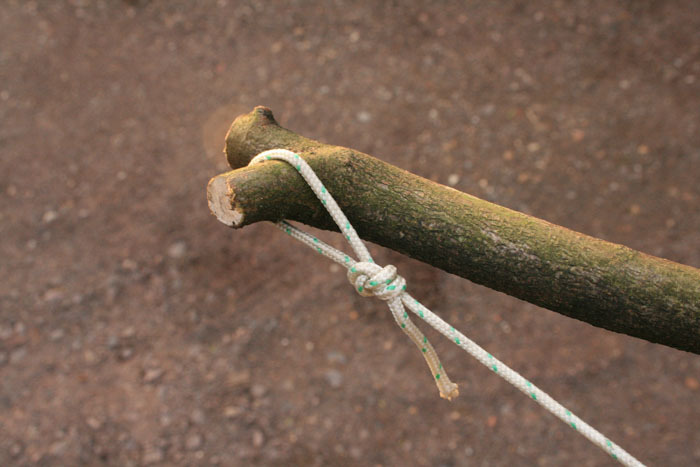 Instead search for dead-standing wood, or wood caught up in other tree branches and so suspended off the ground. Cut a section of wood about a foot long and three fingers wide. 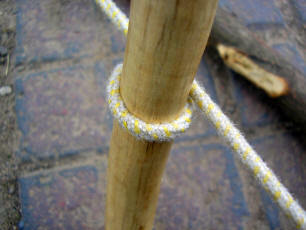 There should be as few knots as possible; knots are too hard. 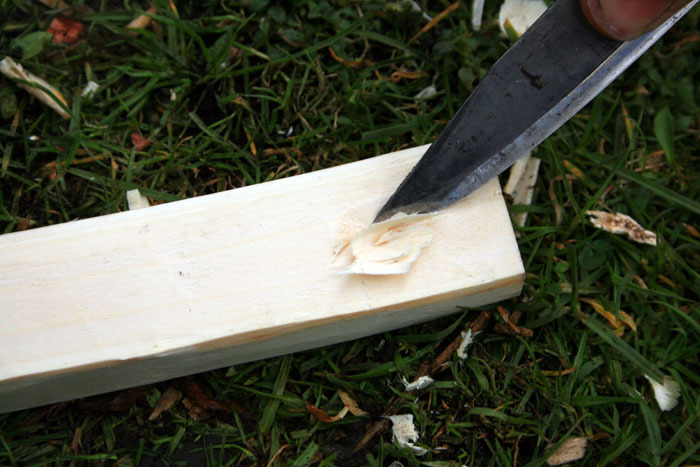 Carve the wood down so that it resembles a small plank. 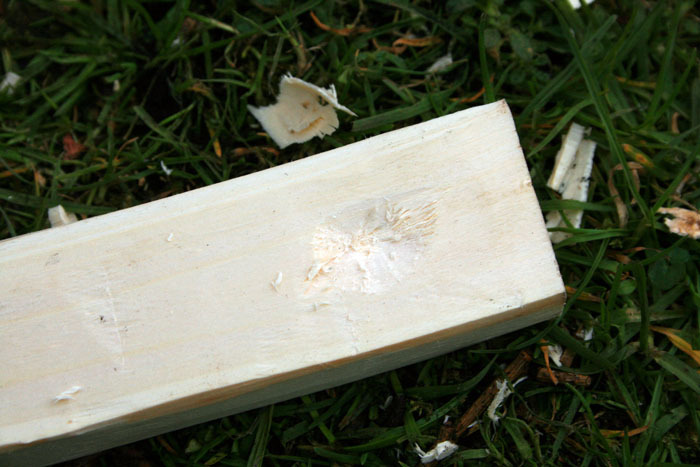 You could start by splitting a round baton of wood in half and then carve the round side flat. A small hatchet is great for this. I never measure anything when i make the parts, but just to see, i measured the thickness of a few of my hearth boards, they are all about 15-16mm thick. This thickness works very well for me.The width should be at least twice the thickness of the drill (about 4cm). Strip the bark off. Then carve one end pointed and the other end into a blunt point as shown. your drill should be perfectly straight and about 6 or 7 seven inches long. The bottom of the drill is carved to a blunt point so that there is a lot of surface area to cause as much friction as possible; whereas the top end ideally needs to be as friction free as possible. I tend to make my drills pretty much always about 2cm thick (do this by eye). 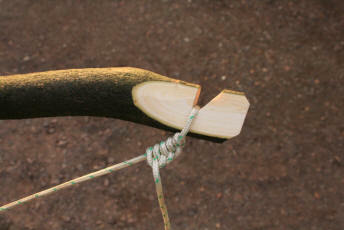 Note: The wider the drill the less full rotations it will make for each stroke of the bow. Also I find it harder to apply as much downward pressure with a wide drill. Many beginners automatically think that the bow should be bendy, but actually it should be rigid and pretty much as thick as a broom handle. If the bow is springy, this can allow the string to slip around the drill. A bow about 85cm long is a good length (from your armpit to your fingertips). A slightly bent shape is nice, although this doesn't have to be much at all. You can tie the ends of the cord to the bow in many different ways. 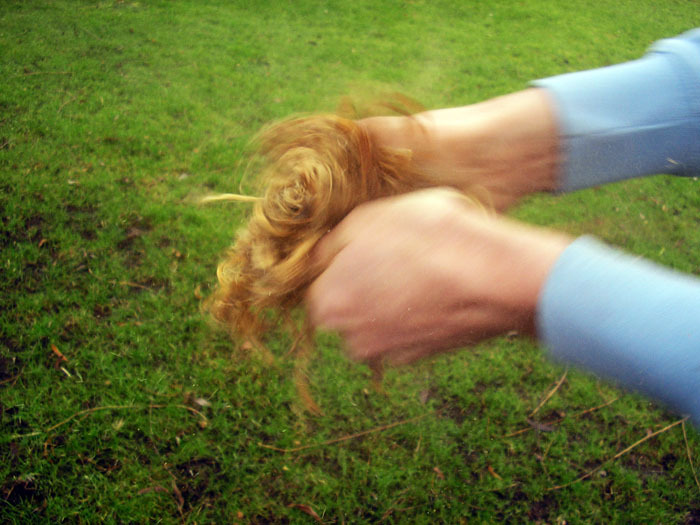 I personally just use a few overhand knotts. Just for fun I personalised this bow by burning patterns on to it using a metal kebab skewer. The bearing block should be as friction free as you can make it, some tough hard wood is best. 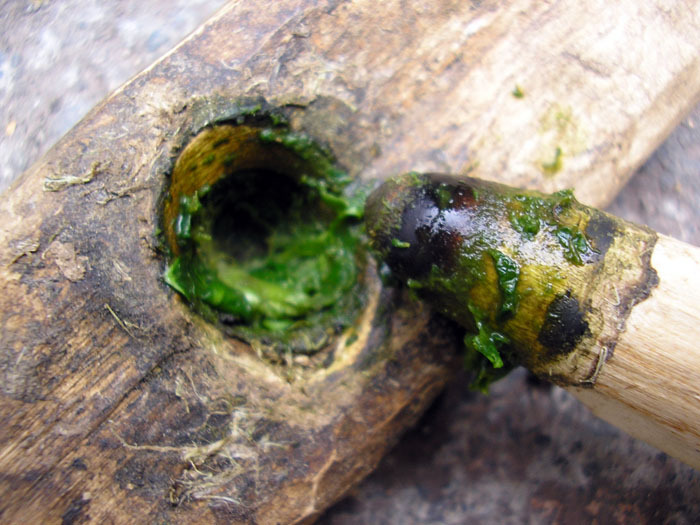 I like to use Yew, elder, holly, oak. The old weathered oak branches that look like bones are pretty good. A small section of wood is all that is needed, I often just split the wood down the centre to produce 2 possible bearing blocks and carve a depression in the centre using the tip of my knife. This small depression will hold the pointed end of the drill in place. You should make the bearing block comfortable to hold. Carve off any sharp corners etc. 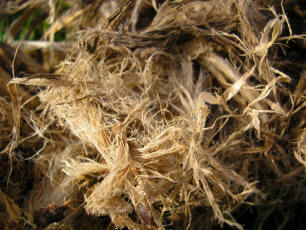 stuffing some fresh leaves into the depression acts as a lubricant to help reduce friction. Ivy leaves are my favourite for this (not poison ivy). These photos show an experiment of mine where i glued a 'devils toenail' fossil into the bearing block using birch tar. This made an amazingly good friction free surface and you can see that the top of the drill has polished off nicely. However due to the friction and heat caused, the tar glue does become too soft... More experimentation needed, I'd imagine hide glue would work a lot better. There are many possibilities for tinder. 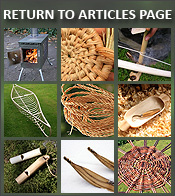 My personal favourites are Lime (Basswood) bark, Clematis bark and Honeysuckle Bark, but there are so many other materials that you could use. Just look around for fibrous materials that are as dry as you can get. A lot of tinder takes preparation. Buffing it between your hands will break the fibres down and produce fine fluffy tinder. Keep your tinder somewhere dry, in a pocket for example. If it's damp, keeping it against the warmth of your body will help to dry it. Ideally you should be in a position that is comfortable, stable and one that allows you to breath properly. You will feel quite tired and energy depleted if you are not able to breath normally (kind of like going for a run whilst holding your breath). This photo shows the most practical and frequently used drilling position. 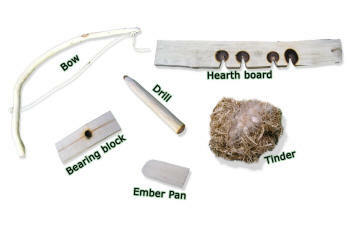 The hearth board is pinned to the ground by your foot to stop it moving. The bearing block is held against your shin to keep the drill from wobbling about; this is VERY important. The drill is twisted into the string, Ideally with the loop on the outside of the bow. 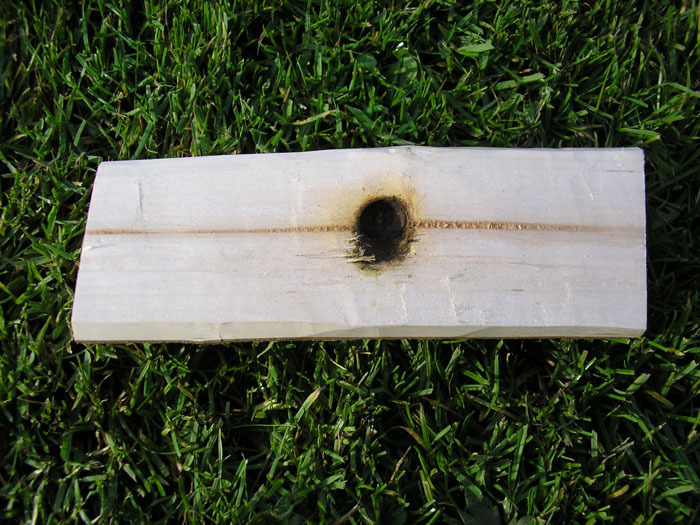 Before you start drilling, you need to make a slight depression in the hearth board where the base of your drill will initially sit. Make the depression with the tip of your knife. 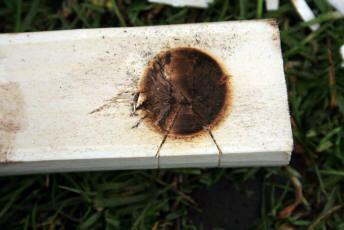 Now take up position and begin to bow until you have burnt a nice circle the width of the drill. Now before you proceed you will need to cut out a notch into the centre of this circle. The notch should be 1/8th of the of the circle. I usually mark it out first by scouring with my knife as shown. place the ember pan under the notch. 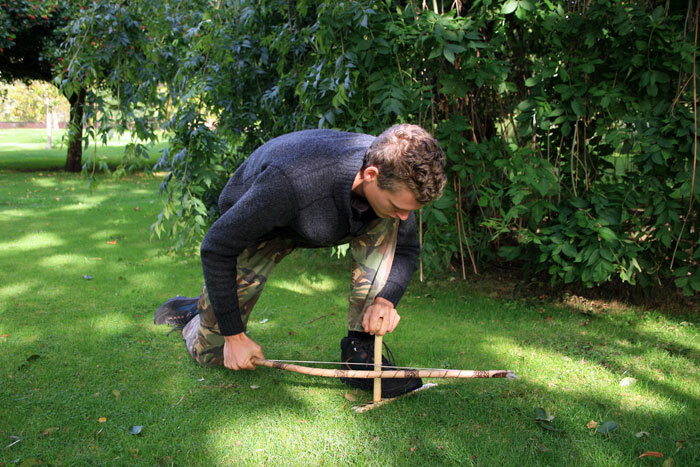 Now you can start bow drilling again, but this time for longer; give it everything you've got! Apply pressure from the top with the bearing block and bow smoothly and quickly. Once you get a good rhythm going try to maintain it. Smoke will soon start to rise and will get thicker. The time it takes to create an ember will depend on the properties of the wood and how good your technique is. If you don't apply enough downward pressure, the surfaces in contact with each other will polish and begin to screech; causing insufficient friction. If your technique is good (which usually takes lots of practice), and all the conditions were right, then you'll most likely get an ember. It will likely not be as easy as this sounds though. 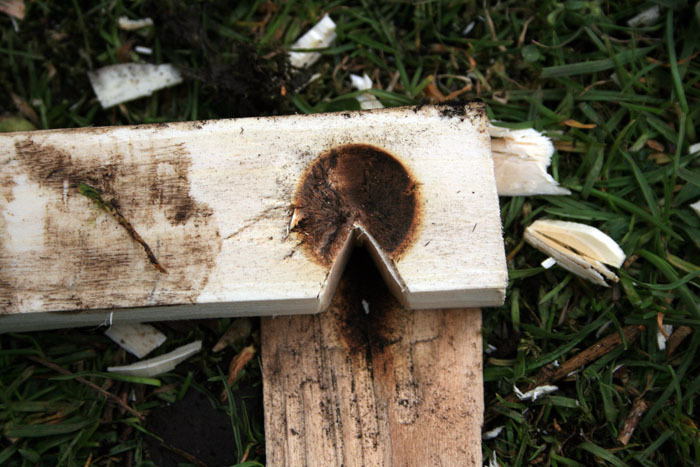 If there is an ember, the pile of black dust on your ember pan will continue to produce smoke by itself. Stay calm, you have some time (although not a huge amount). Encourage the ember a little by gently wafting air over it with your hand. 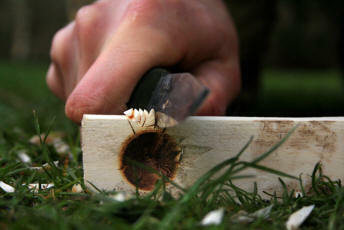 This short time also allows the ember to 'solidify'. If left longer you'll see the hot glow rise to the surface. Peel back the hearth board away from the ember. Now you're ready to transfer it to the finest part of your prepared tinder. 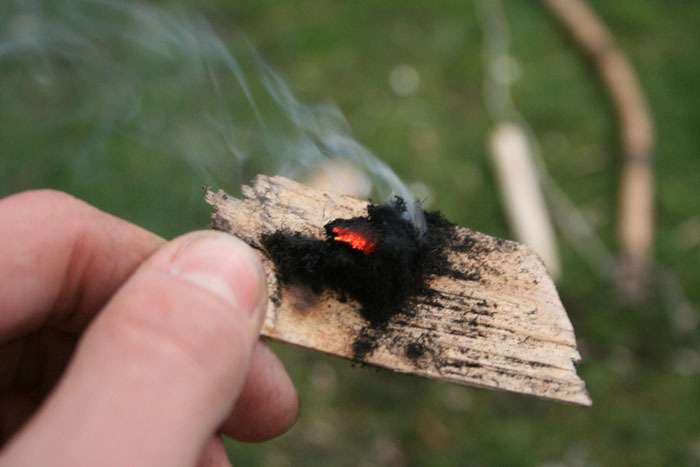 Once you have the ember on your tinder, fold the tinder around it gently but confidently. Now hold the bundle and begin to blow. Don't blow too gently, this little smouldering pile of dust needs feeding with plenty of oxygen if it is to burst into flames... Also, do not blow too close, otherwise the moisture from your breath can discourage it. With more and more air the ember will grow stronger and the tinder will begin to burn, then eventually burst into flames! Congratulations if you achieved fire!